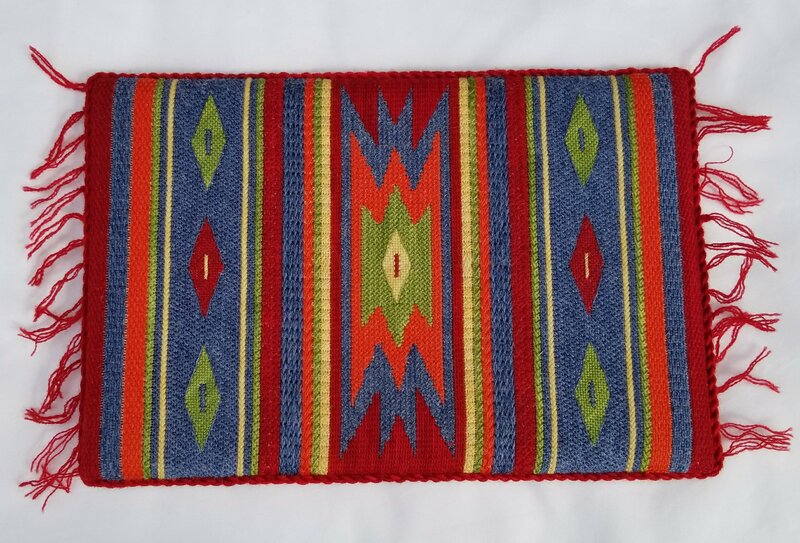 The Diamond Rhodes stitch and Diagonal Gobelin stitch worked up so quickly that I was done during our ANG Keystone Garden Chapter meeting this month. It’s a mystery project that we add to each month for a year. We’re almost done!! 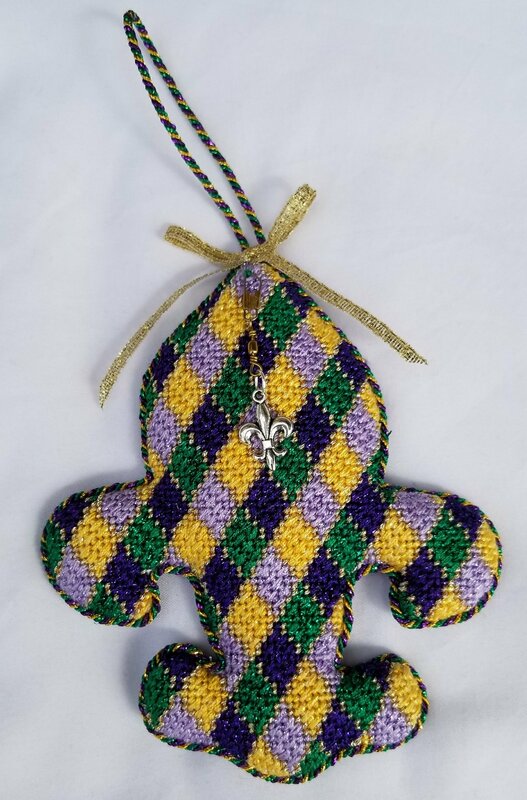 This ornament, Fleur de Mardi Gras by Jude Designs, is the second piece of 3 projects finished from the 2016 ANG Seminar in New Orleans. The charm was a gift from ANG. 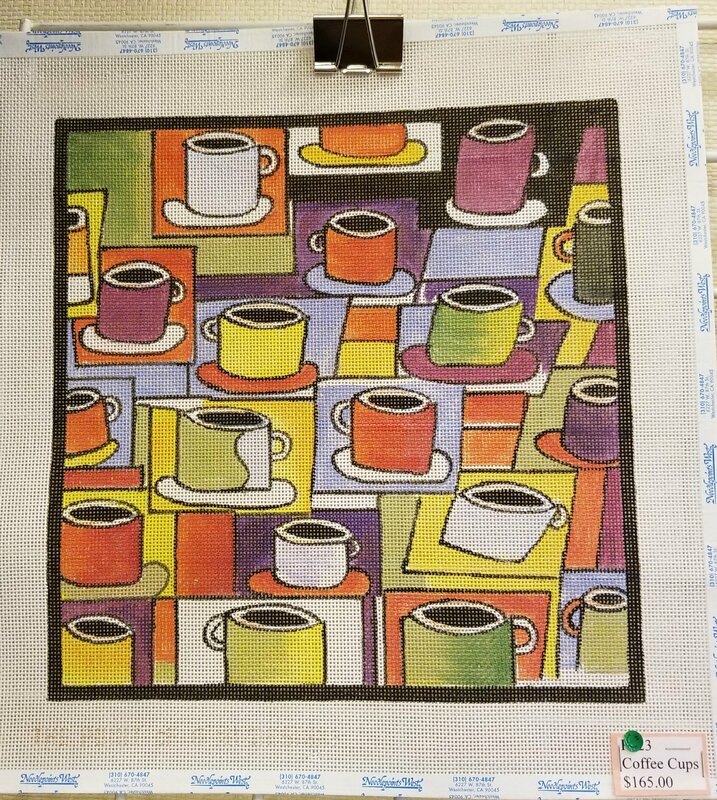 The French Knot was the host shop at Seminar and I picked up this canvas and the threads there. They had a nice variety of canvases as I recall. 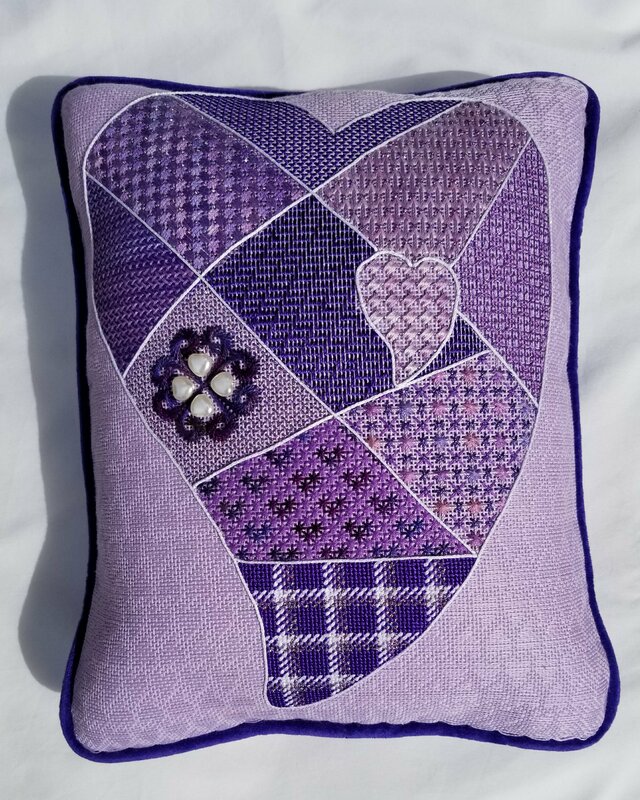 And, the finisher that Karen at Nimble Needle in NJ uses did such a nice job! I really like a small simple bow so it doesn’t overpower the ornament. Needle Nook of La Jolla lived up to their reputation! 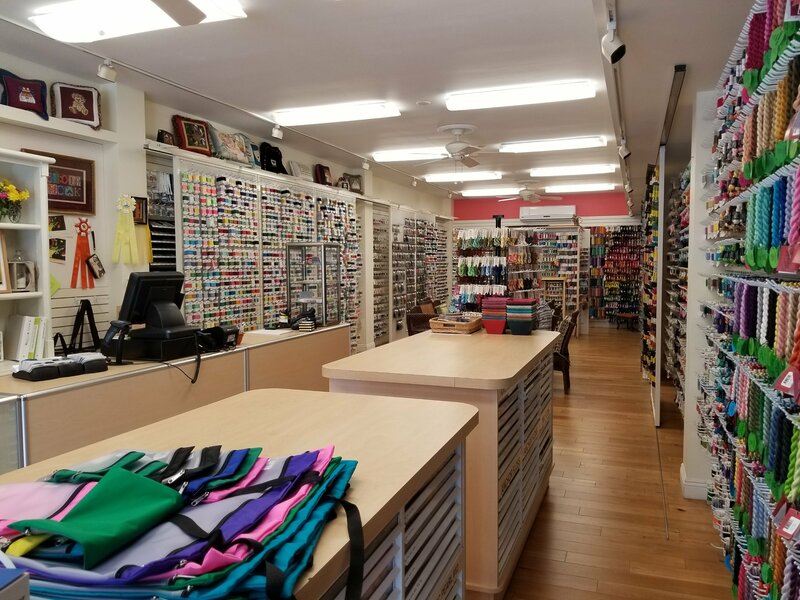 Two stores, one with canvases and one with threads, both amazing. 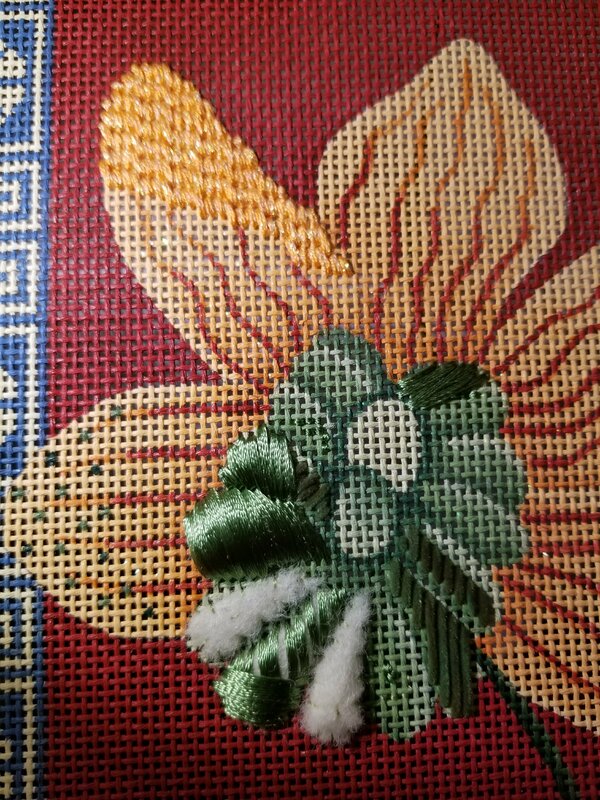 You can’t tell from the pictures but the thread walls slide revealing more threads. They are near a lovely Ocean and have an ocean of lovely threads! You really can’t appreciate how many canvases they have either on the flip boards. Good to see Vicky was there to actually meet her and displaying her award-winning piece. I had seen Nancy working in the exhibit area. All the members of the local ANG chapter did a fantastic job. 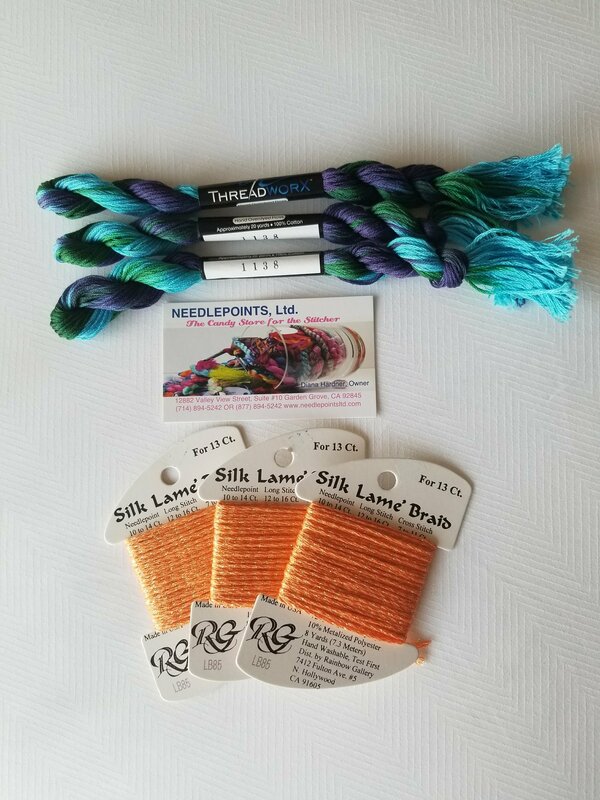 Nothing much I needed except more of the Orange Silk Lame Braid which they had. 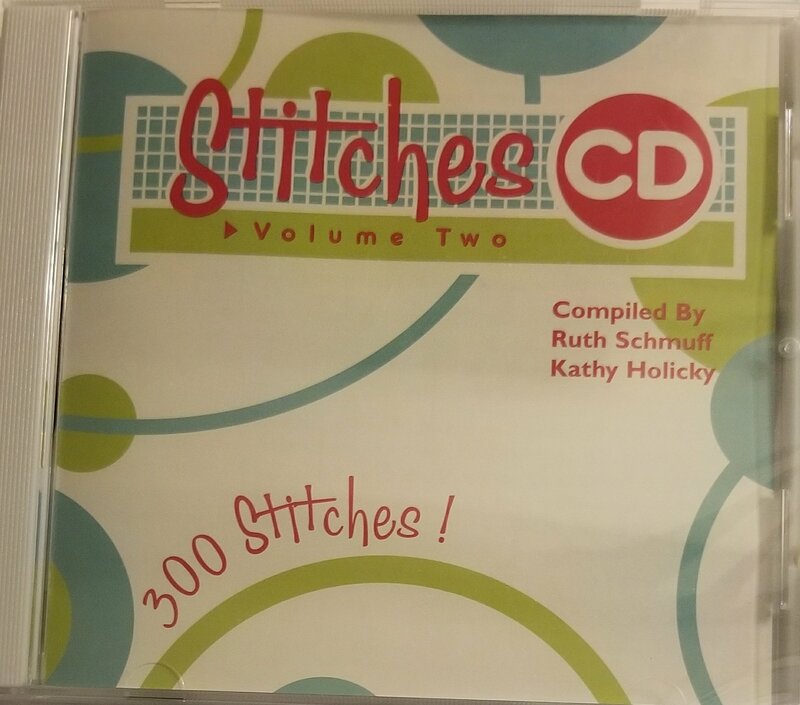 But, I did decide to get the Ruth Schmuff and Kathy Holicky CD called Stitches with 300 stitched. 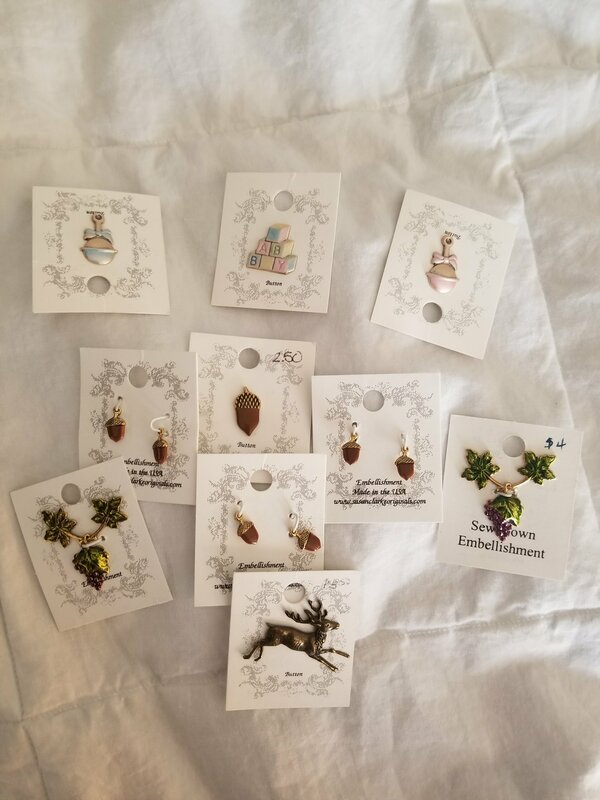 On the back, it says, “Use as clip art to create your own stitch guide.” If I use them, I’ll note which are from the CD versus which ones I create. Hopefully, my diagrams will be half as good. I also want to see how she organizes and names the stitches. I had a great week with Cynthia Thomas at the ANG Seminar in Anaheim! 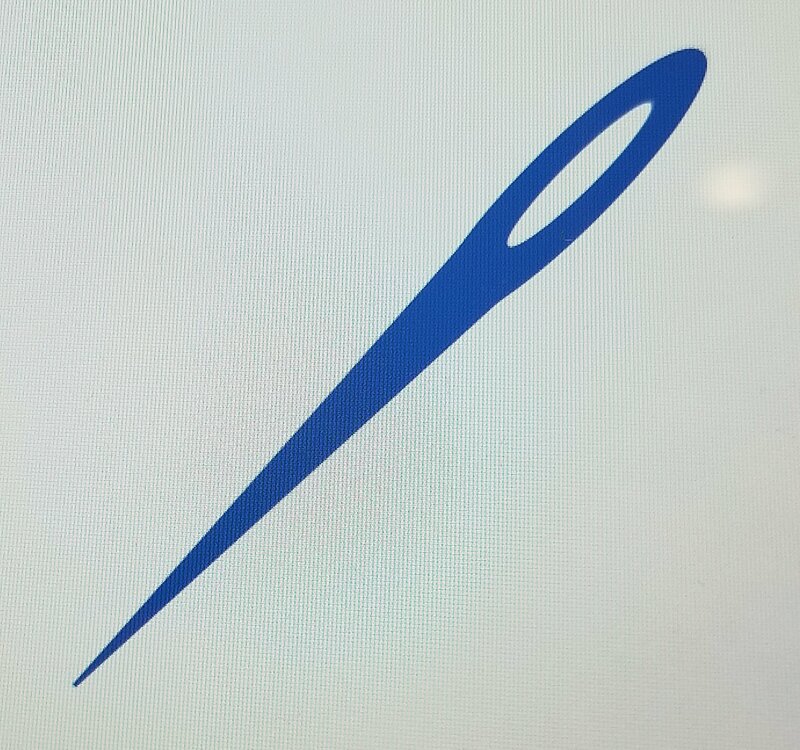 On Monday, I learned how to diagram stitches (including a needle) using Microsoft Office tools. It’s amazing how much we learned and her excellent instructions will be a great guide when I get home. And, I was able to practice some diagrams even during my 4-day embellishment class. I love the stitches Cynthia recommended for my JP canvases. We learned a lot from listening to discussions about each other’s pieces too. 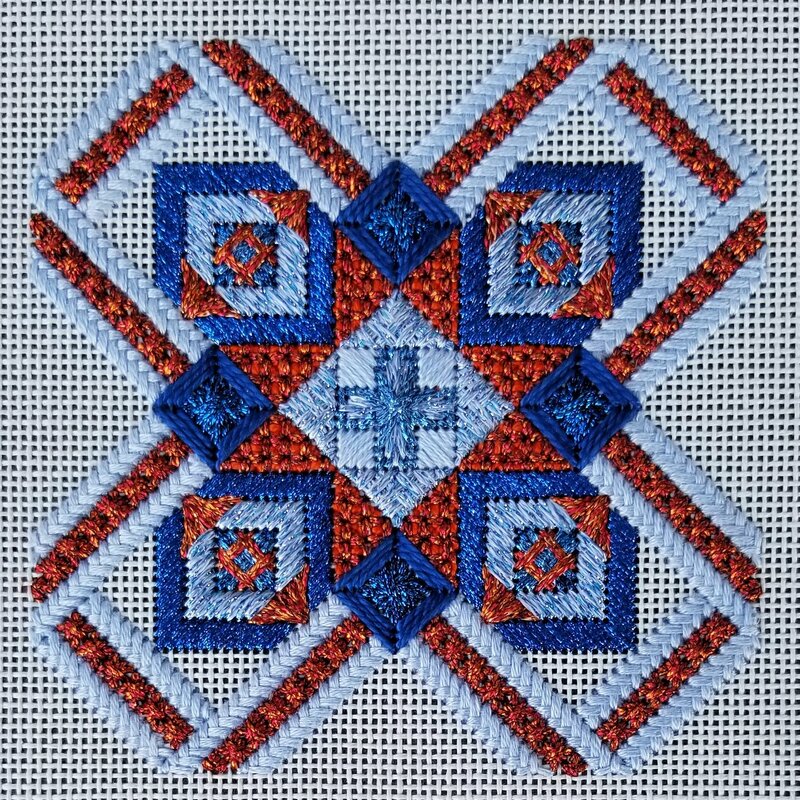 Contact Cynthia for a list of her commercial stitch guides and classes (including her computer class) at needleartisan@hotmail.com (email address shared with Cynthia’s permission). 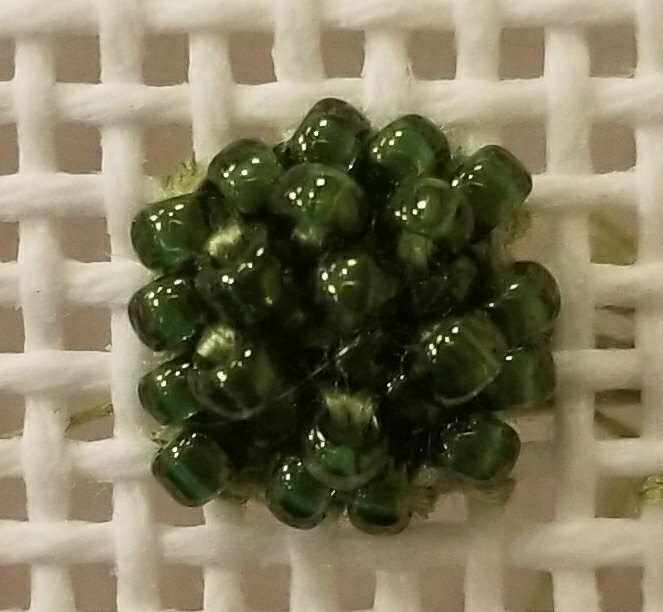 I practiced layering beads on top of beads. And, padding with felt and Very Velvet. A nice door prize! Eventually, everyone got something. Here’s my selection. 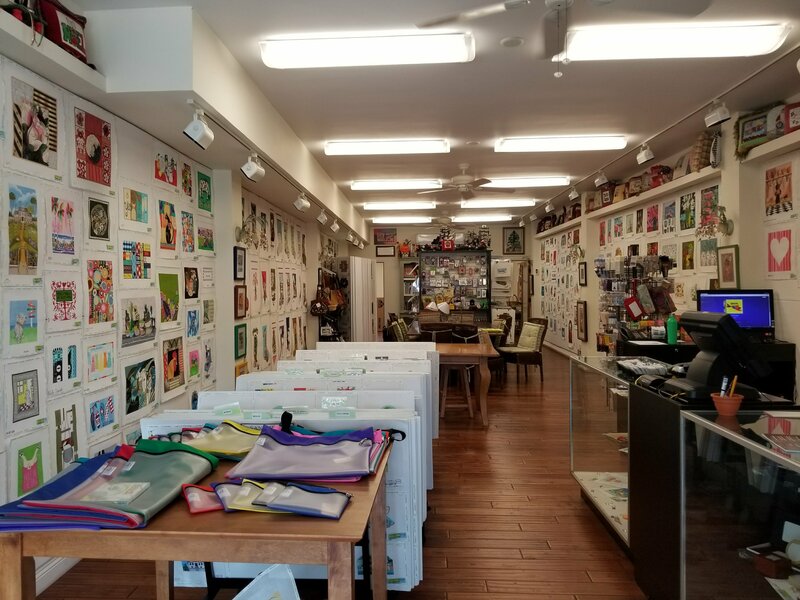 And, Needlepoints West, the store at Seminar, was very generous especially on Friday offering 45% off canvases & 50% off select threads. More on why I picked up this canvas another time. 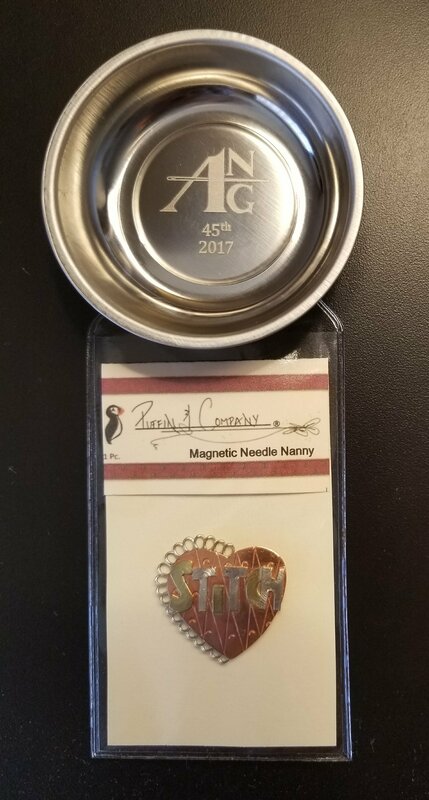 And, they gave the kit for the Nancy Cucci 45th ANG anniversary design away for free. These are the gifts from the opening and closing banquets. David McCaskill got a lifetime achievement award. And, Philip B won the People’s Choice award for 50 Daisies/Flowers. 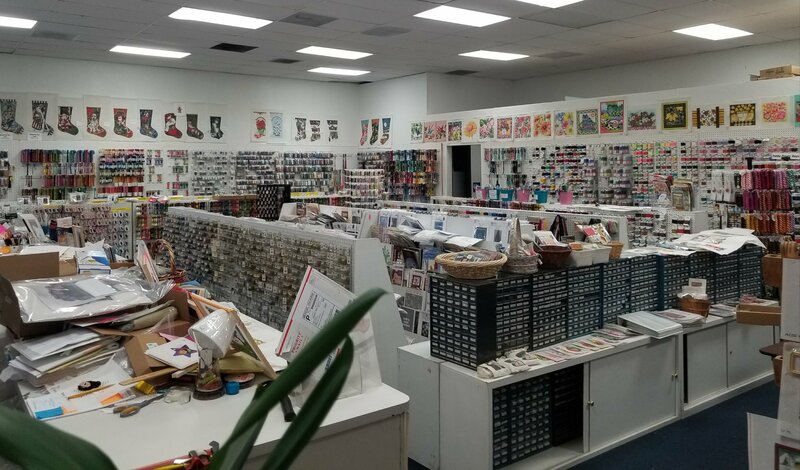 I had to stop briefly at Needlepoints Ltd on our way to San Diego. 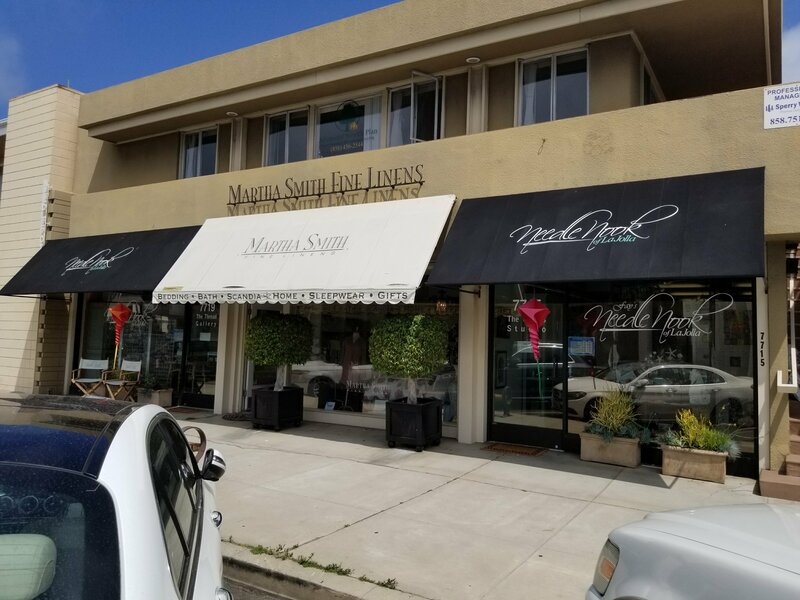 Diana and her store are very nice. Lots of threads. A nice table with magnifier/light stands (around to right but not pictured). Two other ANG members were there when I arrived. 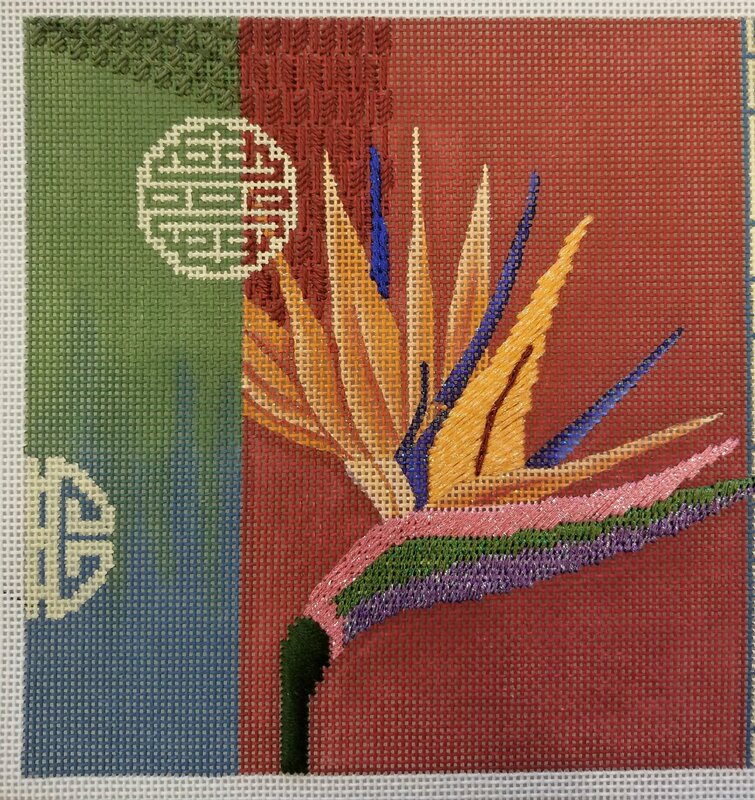 I needed more Silk Lame Braid for my seminar pieces. 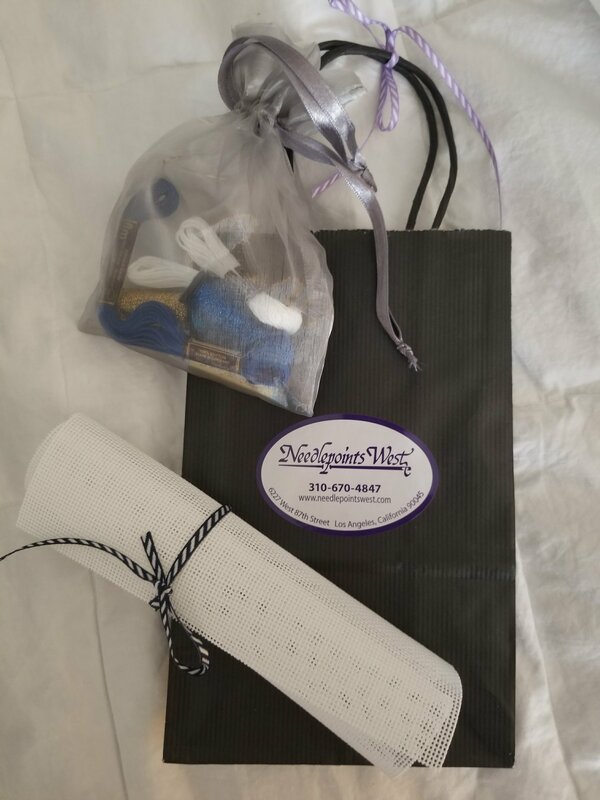 And, there’s more about why that Threadworx but it to is a story for another time.